A group of preservationists has been making the rounds of the neighborhood Olympic forums I wrote about last week, passing out flyers and pestering officials with questions. 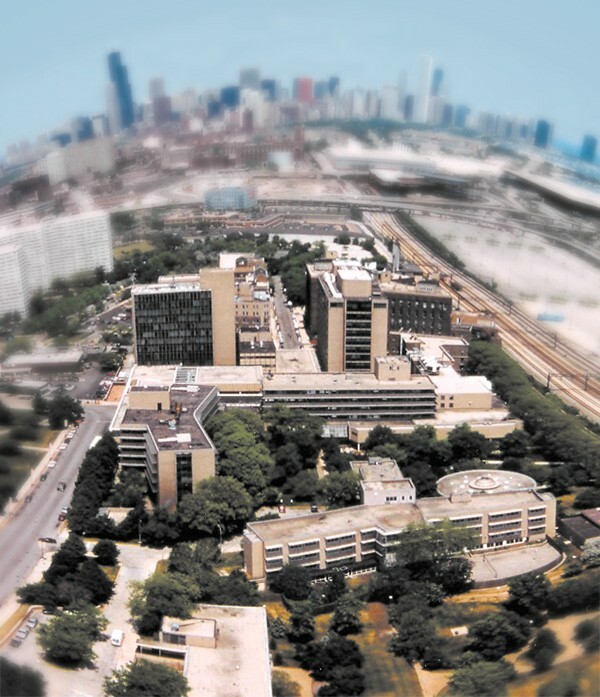 They're not officially opposed to the Olympics, but anyone wondering whether Chicago needs the games should pay close attention to their battle to save the Michael Reese Hospital campus from demolition. I repeat: many of the preservationists are most emphatically not against bringing the games to Chicago. They're basically agnostic on the issue: if the games come, fine; if they don't come, that's fine too. But they are fiercely opposed to tearing down the Michael Reese structures. As they see it demolition is not just environmentally unsound (as opposed to reuse) but also culturally reckless, since they believe at least eight of the buildings were designed in part by the great Bauhaus architect Walter Gropius. "These buildings are impossible to replace, so we should do everything we can to keep from destroying them," says Grahm Balkany, founder of the Gropius in Chicago Coalition. "We're talking about cultural resources of international importance. To frivolously destroy them is inexcusable." To actual opponents of Chicago's Olympic bid, the focus on saving these empty buildings is a head-scratcher, since there are other, arguably more pressing reasons to stop the city from carrying out its plans—such as the probability that they could cost the city billions of dollars it doesn't have. But the city's response to the preservationists demonstrates how the Olympics are likely to drive public policy in this town for the next seven years if Chicago is picked to host them. What Mayor Daley's Olympic planners think is in their best interest will trump every other concern, no matter how big or small. Originally, you may recall, Daley wanted to build the Olympic Village over the railroad tracks near McCormick Place. But in 2007 he shifted his gaze to the Michael Reese site. Last year he had the City Council commit up to $86 million to buy and demolish all of the Reese structures except for one building (which wasn't designed by Gropius) and a parking garage; after that, plans call for a developer to buy the site off the city, build 7,500 units that will house athletes during the games, and then convert them to residences. So if that's the case, the preservationists ask, why can't the city at least promise to hold off on demolishing the Reese buildings until after October 2, when the IOC makes its pick? They've put the question to city and Olympic officials repeatedly in the past several months. The answer is always the same: Chicago needs to send a message to the IOC that it's fully determined to stage the games. (And what would make the point better than knocking down a bunch of buildings that some people happen to think are valuable?) Also, officials say, they need to start now on asbestos abatement and other interior work that has to precede a teardown. "There's a very specific time line to get this built," Arnold Randall, the bid committee's director of neighborhood legacies, said at a recent hearing at the South Shore Cultural Center. "We feel to make that happen we need to begin demolition now." The preservationists don't buy it. First of all, by now they think it has to be abundantly clear to the IOC—if not the whole freaking world—that Daley and the Chicago 2016 gang are dead set on hosting the games. Among other things, they're spending $50 million to win the bid during the worst recession in generations. Second, if Chicago does win, holding up demolition for a couple months really shouldn't make or break the Olympic Village project, even in a city well known for overruns and delays. "There's other buildings they could demolish first besides the really valuable ones," says Balkany. "They'd still have almost seven full years to get the project done." Moreover, the preservationists argue, why cut off your nose to spite your face? If the buildings are not just gutted but ripped down and Chicago doesn't get the games, we'll be left with a big vacant field on the south lakefront and building something else from scratch will be the only option. If the buildings are left up, developers would at least be able to reuse some or all of them. "We say it again and again," says Balkany. "What's the rush?" They said it again at a July 21 meeting at Olivet Baptist Church, at 31st and King Drive. Chaired by Fourth Ward alderman Toni Preckwinkle, the meeting was held to discuss potential impact of the Reese demolition on residents of the nearby Prairie Shores complex. Following a presentation by Cassandra Francis, director of Olympic Village development for Chicago 2016, Preckwinkle warned the preservationists she wasn't going to take any of their questions until Prairie Shores residents were through with theirs. And so at least a dozen preservationists, wearing their Walter Gropius T-shirts, waited in the back of the room while Preckwinkle and Francis fielded questions about everything from construction noise to asbestos removal to rat migration. It was obvious that the Olympic plans are very important to residents of Prairie Shores. The 2016 Olympics may seem like some far-off, abstract proposition to many Chicagoans, but not for those in the unenviable position of living next door to a mammoth construction project. And lots of Prairie Shores residents say the city has already started the Michael Reese work in typical shoot-first-ask-questions-later fashion. At the meeting they noted that workers had begun clearing out some of the buildings immediately after the city took control of the property on July 1. In their efficiency they didn't use chutes to drop trash from the buildings into Dumpsters, and sheets of paper blew all around the area for days. Preckwinkle heard their gripes and recited her office phone number, telling them to call with new or ongoing concerns. Francis apologized and promised residents that they wouldn't have to worry about litter again—from now site workers would use chutes to get rid of waste. It took more than two hours to answer most of the questions from Prairie Shores residents, leaving little time for the preservationists to say their piece. But someone did get to ask Preckwinkle the central question: why can't demolition at least be delayed until October? Preckwinkle replied that questions about Reese would be addressed at an August 11 meeting. How do we know the hospital won't be demolished by then? the preservationists persisted. "I talked to [Chicago 2016 president] Lori Healey this morning," Preckwinkle said. "She told me that there are no plans to do any demolition before October 2." At first the preservationists cheered, as if they'd won a major victory. But within minutes they started parsing what Preckwinkle had said and realized it was no victory at all. "'No plans' means only that there are no plans today," noted realtor and activist Brad Suster. "That doesn't mean that they won't draw some up tomorrow." Two days later, in fact, the city's Public Building Commission awarded $11 million in contracts to two demolition firms, Brandenburg and Heneghan Wrecking, for asbestos removal and other "interior demolition." Really, from Mayor Daley's perspective, it makes the most sense to tear down all of the Reese buildings, including the most treasured, just to get the preservationists off his back. Once those structures are gone, there won't be a lot of incentive for preservationists to keep showing up at meetings about the Olympics. Balkany contends that demolishing the buildings could provoke at least some preservationists to get off the fence and actively join the Olympics opposition. Maybe he's right, but by then it'll be too late. When Mayor Daley had Meigs Field torn up in the middle of the night, the opposition rallied with public relations campaigns and lawsuits. They scored some political points, but Meigs was still gone for good, and everyone knew it. Ben Joravsky discusses this column weekly with journalist Dave Glowacz at mrradio.org/theworks. And for more on Chicago politics, see our blog.